Sure enough, as I would later learn, via continuous listening to Frankie Crocker, that the Dells had indeed originally released the song "Oh What a Night," back in 1955. 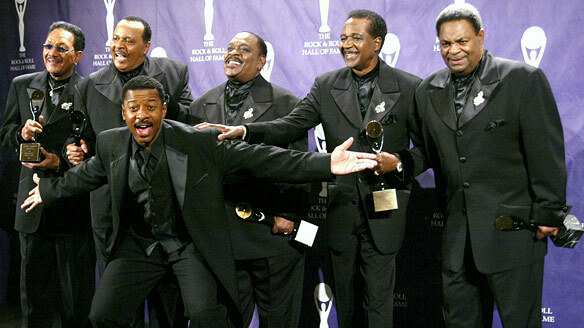 Frankie said that it had been a hit song and that the Dells were one of the few "doo wop" groups that were still around and kicking. He also said that the Dells lead singer Marvin Junior had co-written and sang on the original 1955 version of the song. And that they are. Marvin Junior might just be the single most influential "voice" in the history of Black music. His influence on male singers like Teddy Pendergrass, David Ruffin, Cee Lo Green and others are quite obvious. Other influences are just as powerful, but perhaps not quite so obvious. Take for example our friend Chuck D, front man of the legendary rap group Public Enemy. A few years ago, Chuck D. told me that when he first started, he intentionally set out to sound as much like Marvin Junior as possible. I didn't quite believe him, so I decided to spend an afternoon listening to Public Enemy songs & Dells songs, back to back to back. The vocal similarities are astounding. Chuck really does sound like Marvin. Not exactly, but "almost," in the same kind of way that Teddy Pendergrass and David Ruffin did. But more important would be to think about and consider exactly why Marvin would have such a multi-generational influence? Well I think that is also painfully obvious. Marvin's voice is that of a proud and virile Black man. It is of someone who recognizes the struggle that he faces and faces it head on. It is a voice of teachers and preachers. It is a voice that all men who want to influence others would want to emulate. It is in fact the voice of leadership. Listen carefully to speeches of people like Martin Luther King. Jr., Jessie Jackson, Louis Farrakhan and others. Listen to the voices of some of your favorite Black politicians, DJs, actors, etc. Don't many of them sound like they are emulating the voice of Marvin Junior? All of this may just be too much to think about or to consider, after all, wasn't this man just a singer? Or even just a great singer? After all, the whole topic of Rhythm & Blues itself is a pretty complex topic, and perhaps its complexity is best left alone and we should simply focus on the songs? However he was quite interested in Soul-Patrol. He told me that he would have someone print out many of the things I had written, and whenever I would see him, we would have conversations about some of the topics I had written about. Once backstage Marvin said to me; "Bob one of the reasons that I like you so much is because you understand that Rhythm & Blues is a complex thing. Of course I knew just where he was going, but I could tell that he wanted to let it all out, so I said to him...How so Marvin? Marvin said; "One of the reasons why some Americans prefer Blues over Rhythm and Blues, is because Blues is pretty simple. Blues is easy to play and it's easy to relate to. Blues is straightforward, simple, and reflects a back to a time that is simple and uncomplicated. Rhythm and Blues on the other hand was born first of the complexities of the great migration of Blacks from the south, then the complexities of World War II and the integration movement of the 1950's/1960's. Rhythm and Blues is complex, it's harder to play, harder to interpret, it's complicated and carries with it implications for America that some Americans don't want to deal with." They were thinking; "the Dells are nothing but a broken down, bunch of dumb doo wop singers." They never bothered to get to know Marvin Junior and that was their loss. They just might have missed out on their opportunity to learn something about Rhythm and Blues. But then again, maybe that is what they were afraid of? "Bob, what I don't understand is why when these guys decide to go solo, they don't take the rest of the group with them? Seems to me that even as a solo artist, you still need background singers, why not keep the same background singers who made you successful in the first place? After all, these are the people who best know how to maximize your strengths and minimize your weaknesses..."
But Marvin was their lead singer, on most of their songs. And he certainly could have become a "solo artist" had he wanted to. But instead he stands as a shining example of "leadership among equals." And that my friends is something that we can all take inspiration from. Bob Davis is co-owner/creator (with his brother Mike) of the award winning Soul-Patrol.com. Davis was instrumental, along with Soul-Patrol.com, in helping The Dells to become inducted in the Rock and Roll Hall of Fame. Follow him on Twitter @Kozmicfunk.